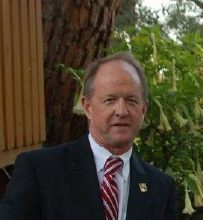 Press release posted 5/7/16 – The volunteers of the Sierra Madre 4th of July Committee are pleased and excited to announce that the 2016 Fourth of July Parade Grand Marshal will be Sierra Madre’s man of many hats Pete Siberell. “The Grand Marshal is a person or persons whose efforts over a long period of time has been beneficial to the community of Sierra Madre. The title of Grand Marshal is intended to honor a person or persons’ volume of work, dedication and overall enhancements to our community.” Pete has demonstrated time and time again he is the Spirit of Sierra Madre. Since moving to Sierra Madre more than twenty years ago, Pete has been active in the community. He been a community leader with Sierra Madre Little League, serving as President for three terms, a two term member of the Library Board of Trustees, head of the Mt. Wilson Trail Race Committee for close to 20 years, and much more. He was also on the board of the former Arcadia Chapter of the American Red Cross and he was the Sierra Madre Chamber of Commerce 2007 Citizen of the Year. Pete is also currently on the board of directors of the Pasadena Humane Society, a position he is very passionate about. Pete cares deeply about Sierra Madre and continues to give back every chance he can. Pete is the Spirit of Sierra Madre. Pete, his wife Marianne and two college age sons still happily give back to Sierra Madre ever chance they get. Additionally, the Committee is proud and honored to announce that the Kristine Lowe has been selected as a “Hometown Hero”. A lifetime Sierra Madre resident, Kris Lowe is a well-loved member of the Sierra Madre community. A retired Captain for the Sierra Madre Volunteer Fire Department (SMVFD), she served the community for more than 15 years. She continues to volunteer her time to her community through charitable events such as the Friends of the Library Wine Tasting, Wistaria Festival & the SMVFA. She is also the newest member of the Sierra Madre Community Foundation. 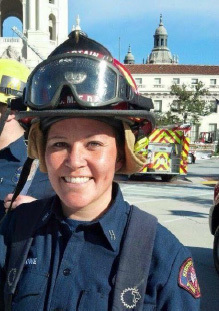 Kristine is currently a teacher with the Glendale Unified School District, and the coordinator for the Public Safety Academy at Hoover High School, a program which certifies youth for disaster preparedness and emergency response. She truly is preparing the next generation of heroes. The Committee is also pleased to announce the Official Sponsor of the 2016 Parade is The Kensington. The Kensington-Sierra Madre is an assisted living and memory care residence in the heart of Sierra Madre. The committee and community join us in thanking them for their partnership this year as we work together to bring the community and outstanding All-American Celebration. For more information on all of the 4th of July Festivities, please visit www.SierraMadre4thofJuly.com.